"The Most Popular Decorative Vinyl Shutters In The World" Everyday Low Prices! Question: How do I choose between standard or custom shutters? Answer: Standard size vinyl shutters are the most affordable shutters, but come in limited sizes and styles. When you need shutters in a style or size that is not in our standard line then custom size exterior vinyl shutters may be the answer, since they are offered in far more style and size options. 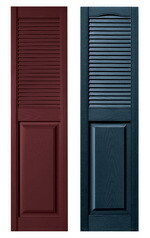 Mid-America exterior vinyl shutters are sold by the pair and are shipped with included installation mounting hardware. Want to update the look of your house? We give you choices! Choose new exterior shutters for your windows, it is an easy do it yourself home improvement project that will really show from the street. Add fresh curb appeal to your home with affordable decorative vinyl exterior shutters; update that tired plain house with beauty and color. Exterior home improvement projects can give you great value and satisfaction and may increase the value of your home. 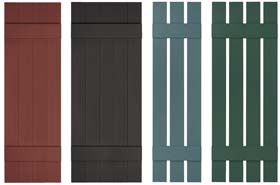 Certainly, sprucing up the outside of your home with new shutters and colors will give you enjoyment. Every Vinyl exterior shutter we sell is Made in America with pride! Buy Mid America shutters online and we ship them direct to your home our business. At ExteriorShutterSource.com we are your source for exterior home solutions products. What does this mean to you? We know shutter products, and have sold and installed them for over 25 years. This focus allows us to bring you the best in exterior shutter solutions and customer service. Our products are easily installed by DIY homeowners or handyman and painting contractors or home builders. Our shutter products are sold and shipped nationwide and are made in the USA.